Dunston was a small farming settlement at the junction of the River Team and the River Tyne, with houses spreading to the west along the Tyne south bank. where small-scale coal working had been carried out for centuries until its location close to the river led to the development of large-scale coal mining in the 17th century. During the 19th and 20th centuries Dunston became a largely industrial area including colour and chemical works, patent nail works , firebrick works , engine works, Crowley’s ironworks and sawmills. J. T.Carr, esq , deputy master of the Trinity-house, and W. A.
of a peculiarly striking character. LOWSIDE, or Lowhand, a township, in the parish of Whickham, union of Gateshead, W. division of Chester ward, N. division of the county of Durham, 2 miles (W. S. W.) from Newcastle-upon-Tyne; containing 1192 inhabitants. The ancient vill and manor of Farnacres, in this township, gave name to a resident family; and in Bishop Hatfield's time was held by Robert Umfraville, who in 1428 obtained licence to found a chantry in a chapel here, to which the hospital of Frereside was annexed in 1439: after the Dissolution, Farnacres was added, by purchase, to the Ravensworth estate. The village of Dunston is also situated in the township. Norwood Colliery, Dunston was reopened by the Swalwell Garesfield Company. 1903 Dunston Tram Service opened. 1904 Dunston Board School (built 1874) was taken over by the County Council; the headmaster was Mr. C. McIntyre. 1905 Dunston Colliery opened. Dunston Christ Church had the chancel extended and a new vestry and organ. 1906 Wood Street Methodist Church was opened. 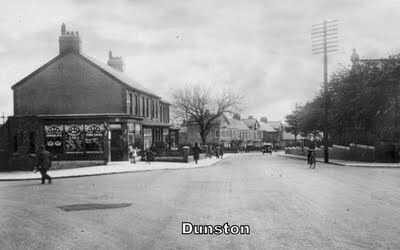 1907 Dunston Excelsior Social Club was formed in a house in Athol Street; the present club building was opened in 1910. There was a Rifle Range in the club during the First World War and Dunston Lads became the English Rifle Champions. Dunston Railway Station was opened. 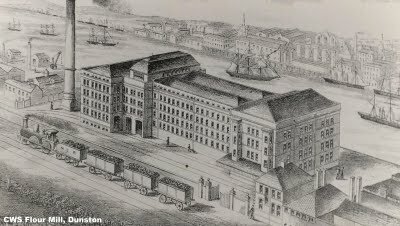 1908 The Co-op Flour Mill site was extended to include the Soap Works; key workers were brought from Manchester Soap Works. 1909 An addition to St Phillips Neri RC School was made in Dunston. 1910 Dunston Hill School was opened. Dunston Power Station opened and was called The Newcastle Electric Supply Company. 1911 Dunston Wesylan Chapel had its own Cricket Club. 1914 Dunston Hill Hospital was converted into an Orthopaedic Hospital. 1920 Dunston Chapels had a Ladies Hockey Team and a Football Team. 1922 Wood Street Chapel was extended. 1923 The opening of Dunston Social Club (its origins go back to 1983 and The Clavering Avenue Club). 1924 The Boys Brigade began in Wood Street Chapel. 1925 Wood Street Chapel held an "Electric Lighting Night" after cables were laid from The Dun Cow to Four Lane Ends. 1926 Dunston Station was closed to passenger traffic. Many people were out of work due to the General Strike and meals were served in the "Tin Mission". 1929 The first St. Nicholas's Church was opened in Dunston. 1930 A new Catholic school was built in the Teams for the senior pupils from St Phillips school. It was called St Joan of Arc. 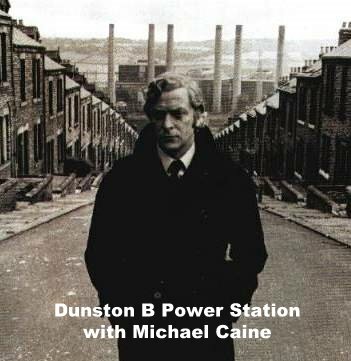 Commencement of the building of Dunston Power Station. Dunston Park was developed, before that people took a short cut over waste ground. 1931 Dunston Power Station became the Central Electricity Supply Company. 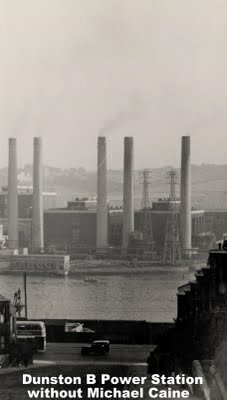 1933 Dunston Power Station was replaced and was the first power station of frame and glass wall construction in England and possibly the world! 1934 A new bridge was constructed over the gut (River Teams) in Dunston. 1935 The Silver Jubilee of King George V. Celebration of 100 years of Methodism in Dunston. 1936 Men on the dole worked on building a bowling green in Dunston Park. 1937 Coronation of King George VI; schoolchildren given commemorative cups. New extensions to the Flour Mill at Dunston. 1939 Dunston Lecture Hall was requisitioned for the Home Guard. 1940 Temporary closure of Dunston Council school and St. Philips Neri because of the evacuation of pupils. The remainder of teachers and pupils worked on a part time basis with their own Head Teachers at Dunston Hill School. Soldiers from Dunkirk billeted in Dunston School - on arrival they were offered a hot bath and their first good meal since leaving the French beaches! Troops from The BEF were billeted overnight in the concert room of the Excelsior Club and the Lecture Hall, Dunston. 1941 Catholic school reopened in January and the council school reopened on August 26th. 1950 Methodists raised funds to repair and decorate the Lecture Hall after its use by the Home Guard. 1951 Dunston Tramway, the last surviving tramway on Tyneside, closed. The last tram ran at 11.22 pm on the 4th August. 1953 A pig was roasted in Dunston Park to celebrate the coronation - a washout due to heavy rain. Holmeside Hall Labour Social Club was opened in Dunston. Hexham Road Methodist Church celebrated its Golden Jubilee. 1954 Gateshead County Borough applied for permission to build a secondary school on Whickham Highway. 1956 Wood Street Chapel celebrated its Golden Jubilee. 1959 A proposal for swimming baths at the junction of Market Lane and Carrs Bank. 1961 The plan to build swimming baths in Dunston was approved. 1963 Wood Street and Hexham Road Methodist Churches united. 1964 Plans were approved for a Health Centre in Dunston. 1965 Dunston swimming baths opened. Dunston Station was closed to goods traffic. Consecration of the new St. Nicholas Church. 1966 Mount Hooley Estate, Dunston was completed. 1969 Dunston Social Club's new premises opened. 1972 Temporary closure of Ellison Road, Dunston, in connection with the construction of the Western Bypass. 1973 Beech tree on Dunston Bank given a preservation order; estimated age 300 years. New mini-roundabout at bottom of Carrs Bank. 1974 Centenary year for Dunston County Infant and Junior School. Dunston Staiths, the largest wooden structure in Europe, became a listed building. Dunston became part of Gateshead Borough. 1976 Dunston Parish Church closed because of subsidence. .
1979 The last ship was loaded at Dunston Staiths. 1980 Dunston Power Station ceased generating electricity. Wood Street Chapel was demolished. 1981 The Lecture Hall was hired by the BBC for the filming of "Play for Today". 1984 Work began on the Metro Centre. Dunston Railway Station reopened. 1985 Ravensworth Road and Dunston Hill Chapels together celebrated 150 years of Methodism in Dunston. 1990 Gateshead Garden Festival took place on Norwood Coke Works Site, which earlier (1874) was a flower garden. At Dunston Hill are the remains of an Elizabethan colliery, now a Scheduled monument of recognised national importance. The well preserved remains of the wagonway cuttings and embankments are amongst the finest examples of pre-1720 railway engineering in the country. Later, mining in Dunston centred on the Team and Norwood Collieries, and Dunston Colliery. 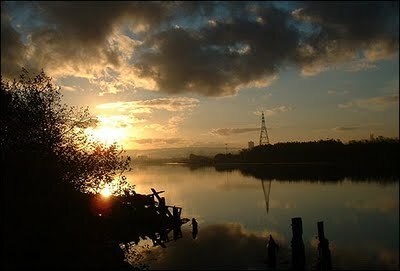 Much of the coal mined in the surrounding area was shipped from the Dunston Staithes. 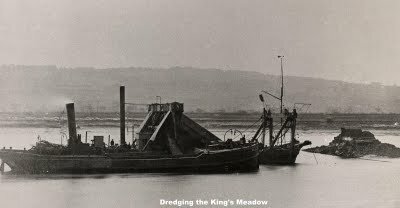 Keelmen worked flat-bottomed keel boats, collecting coal from the earlier staithes and transferring it to colliers (larger sea-going vessels) which transported the coal to London. 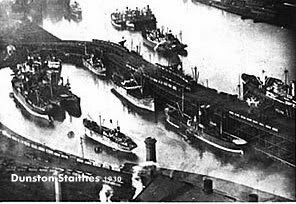 The Staithes we now see, built in the early 1800s, extended further into the river and coal could be dropped directly into the holds of the colliers thus cutting out the need for the keel man or middleman. A second similar staith was opened in 1903, immediately to the south, and a basin dug out of the riverbank to service it. There are six berths, and loading can be carried out at any state of the tide; three electric conveyors and twelve gravity spouts. Record yearly shipment was 5½ million tonnes. The second set of staiths was taken down to the top of the piles in the 1970s and then further dismantled in the 1980s. However, the majority of the structure survived intact and was restored for the Gateshead National Garden Festival in 1990 The staiths were the last working timber staiths on the Tyne. They were severely damaged by fire during the night of 19/20 November 2003. The section of the Newcastle to Carlisle Railway from Blaydon via Dunston to Redheugh was opened in 1837, but completion of the route to Newcastle had to wait until the opening of the High Level Bridge (1848). The line was opened in 1907 but the station did not open until 1909. The population served by the station in 1911 was 6,050 but there were 44,780 tickets issued that year. There was previously a line through Dunston, which ran from Carlisle to Gateshead. During World War 1 the station was closed. It was closed to passenger traffic in 1926 although the line was still in use for through trains to Carlisle. The station continued in use for goods traffic until 1965. The principal goods loaded at the station in 1913 were flour/bran, creosote/tar and timber. The station was re-opened on the 1st October 1984 but none of the original station building remains. The island was popular for its public house, horse races and amusements. In the 1800's the big spectator sport in the area was rowing ...bigger than football is today...and the Jackie Milburn of rowing was Harry Clasper one of the five rowing Clasper brothers of Dunston.. The one time Power Station was one of the most advanced power stations in the world in the 1930's. An extension was built after WWII and the power station ran until the 70's when the site was used for the Metro Centre As a result of industrial development Dunston also grew as a residential area, incorporating a variety of public buildings and amenities, including churches and chapels, schools swimming baths and a transport infrastructure. Later important industrial activities at Dunston included the Norwood Cokeworks. The cokeworks were built in 1912, and upon completion were producing 225,000 tons of coke per year. They finally closed in 1980 and in 1990 the site was used as part of the Gateshead Garden Festival. The Cooperative Wholesale Society was one of the largest employers in Dunston with its Flour Mills and Soap Works. For some great pictures by Steve Ellwood CLICK HERE then click Dunston The grain silos of the flour mill had a capacity of 2,500 tons and the mill produced 5,600 sacks of flour per week The soap works on Colliery Road were built between 1911-1914 and increased in scale by a second phase of building in the 1970s. These buildings are the last, early reinforced concrete buildings to survive along the River Tyne; they were also the first major manufacturing premises of the Co-operative Wholesale Society outside the Manchester area. The Dunston Saw Mills were among the largest in the country. The firm supplied timber to builders, joiners and cabinet makers throughout the North of England. There were two circular saws in the Mills which were used to saw pit props for the many local collieries. The Dunston Hill hospital (63 beds) on Wickham Highway was originally established as a War Pensioner Hospital at Castle Leazes, Newcastle. Eventually in 1928 it was moved to Dunston Hill. It was controlled by the Ministry of Pensions until 1953 when it passed to the control of the Ministry of Health, but it was not absorbed into the National Health Service until 1 April 1956, when it became one of the group of hospitals administered by Gateshead and District Hospital Management Committee. West Farm also known as Dunston Hill Farm or Dunston West Farm is to be found on Whickham Highway and was originally part of Dunston Hill Estate. According to Kelly's Trade Directory of 1906, Thomas Easey was the farmer. Grant aid was available for its restoration. It is currently owned by Mr. Hood and is run as Livery Stables. The streets around the Dunston Hill Methodist Church are all named after the England cricket team of 1900. Dunston Road was formerly known as Asylum Lane. 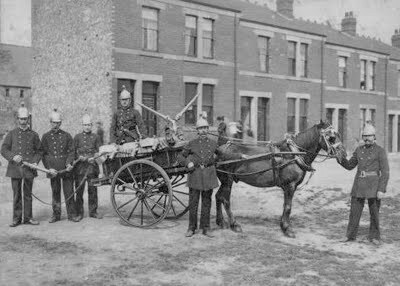 The Asylum stood on the site of the White House and the garage (formerly the Fire Station) and was a large mansion called Dunston Lodge owned by the well-known Tyneside family called Marley. General Marley leased it to Mr.J.E.Wilkman who opened it as an asylum. The venture prospered and in 1841 there were 84 persons housed there, increasing to 157 ten years later. It was one of the most advanced asylums in England and visitors came there from all parts of the world. Its cure rate was well above the results of any other asylum in the country. It gradually declined and the Lodge was eventually demolished in the late 1920s. At the bottom of Dunston Road there is a building that must be one of the oldest in Dunston. This is the old church school, which was erected in 1818, and now in a very dilapidated state. Baker & Fowler Gardens are named after Sir Benjamin Baker (1840-1907) and Sir John Fowler (1817-1898), Civil Engineers, who were involved in the construction of the first London underground railway. They also designed the Forth Railway Bridge. Tyndal Gardens John Tyndal (1820-1893), in his early career, worked on the first Ordnance Survey of England and Ireland in 1842. Parsons Gardens Sir Charles Algernon Parsons (1854-1931), the third son of the Earl of Rosse (Irish), was an engineer and scientist who invented the steam turbine and founded C.A. Parsons Ltd. of Heaton in 1889. Nearby is Newton Street named after Sir Isaac Newton, discoverer of the Law of Gravitation. Barry Street named after Dr. F. W. Barry, who published a report to the Local Government Board on the General Sanitary Conditions of the Borough of Gateshead in 1884. This had far reaching effects on the public health of the surrounding district and ushered in the modern day disposal of sewerage and the supply of clean water to all dwellings in Gateshead. Clephan Street James Clephan was the editor of The Gateshead Observer, the first Gateshead newspaper. Keppel Street Sir Henry Keppel (1809-1904) was commander of the Mediterranean Fleet based at Gibraltar and finished his career as Commander-in-Chief, Devonport. These two streets were built in the early 1900s and were named after the Reverend William Moore-Ede, Rector of Gateshead (1881-1901), who advocated National Pensions and did great work to feed the poor by setting up soup kitchens in times of need. He was deeply loved by his parishioners. This is one of the newer roads in Dunston and comprises Collingwood Terrace, Colliery Road, and Railway Street. It runs from the bottom of Ravensworth Road to join the old Power Station Road near the MetroCentre. Bishop Omer of Therouanne, who died in 670 AD, gave his name to a small area of marshy land at the mouth of the River Team (the Gut as it is commonly known) called St. Omers Haugh. This land was owned by the Hospital of the Virgin Mary, Newcastle and leased by Lord Ravensworth. The Imperial cinema was located on Ravensworth Road and was known locally as the 'Bottom Hall'. It was opened in 1910 and eventually closed in 1961 when it became a tyre depot before demolition.Regretfully it was demolished for road developments. The Albert Picture Palace opened in 1912 on Ravensworth Road and locally known as "The Top Hall". It closed in 1960 when it was briefly a club and then a bingo hall before eventual demolition to make way for the Derwent Court re-development scheme. and many more films shot in the NE. Paul Gascoigne was born in Gateshead, May 27 1967 and attended Brighton Avenue Primary School, Breckenbeds Junior High and Heathfield High. He moved to Dunston when he was 11 years old and lived in Spoor Street. Brian Johnson of AC/DC is a Dunston lad. The 30's film star Victoria Hopper, born 1909 in Vancouver, emigrated to Dunston with her family when she was 14.